pediped® collaborates with The Nik Naks to encourage summer adventures for kids. This summer, award-winning children’s footwear brand pediped® is collaborating with The Nik Naks on an original song and music video that encourages kids to enjoy summer adventures. The original song “Get Up and Go” follows the adventures of two friends as they take a trip guided by their own imaginations. Equipped with pediped’s shoes from the Adventure Line, they are prepared to explore any terrain, from distant planets to their own backyard. The music inspires children to stay active and explore the world around them. The water-safe, rugged and machine-washable shoes in pediped’s Adventure Line, which has 11 new styles for 2018, are ready to go wherever exploring feet can take them. The full “Get Up and Go” video can be viewed on www.pediped.com/theniknaks and the song or full album can be downloaded on TheNikNaks.com. Purchase of the album includes a credit on pediped.com equivalent to the cost. Las Vegas-based musicians Sam Lemos and Jean-Francois are the duo The Nik Naks, the band that imagined this music-based multimedia project appealing to both parents and their children. As dedicated fathers, their combined passion for both music and family life inspired them to expand into the world of kids’ music. Both Sam and Jean-Francois are songwriters, multi-instrumentalists and professional musicians. Their professional credits include playing with Boyz II Men, Cirque Du Soleil, Matt Goss and Noel Gallagher. They are also involved in many original projects in the burgeoning Las Vegas music scene. The pediped® Spring/Summer 2018 Adventure Line is now available for purchase online at www.pediped.com and in select retail stores. Children’s Retail Today publishes new articles each week about innovative, imaginative and inspiring products for children. Contact me today with your great idea! The Nevada-based footwear company plans to open 20 retail boutiques within the next three to five years. Award-winning children’s brand pediped® is also an American favorite- known for exceptional quality and comfort, the distinctive styling has made it fastest growing children’s footwear brand in the United States. The company is also known for its philanthropic efforts; in 2012, pediped was awarded the coveted Earnie Award for Company for Good for their philanthropy efforts of nearly $2 million. 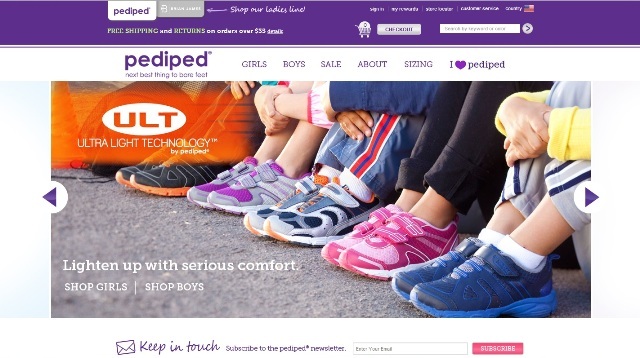 pediped® footwear is currently sold in over 2,500 stores in the United States and 40 countries worldwide with more than 140 designs for boys and girls available, including the signature lines Originals®, Grip ‘n’ Go™ and FLEX®. In an effort to solidify its global recognition as the gold standard in children’s footwear, the company plans the opening of 20 retail stores within the next three to five years, providing an ideal setting for parents looking to gain more access to the endless styles and benefits of the popular footwear. We are working hard to give our international customers direct access to the endless benefits of pediped®. We will continue to look at these markets and are excited to open more doors both domestic and international. In addition to celebrating the opening branded boutiques in Las Vegas, pediped has opened stand-alone retail stores and in-store boutiques in Shanghai and Beijing, China, expanding to the Czech Republic with stores in Prague and Brno, through a partnership with Nohel Group®. Another Hilary Abbott Communications, Inc. client! Children’s Retail Today publishes new articles each week about innovative, imaginative and inspiring products for children. Contact me today with your great idea! Enrolled schools receive 10% back on all attributed purchases, giving parents another reason to shop this award-winning brand. 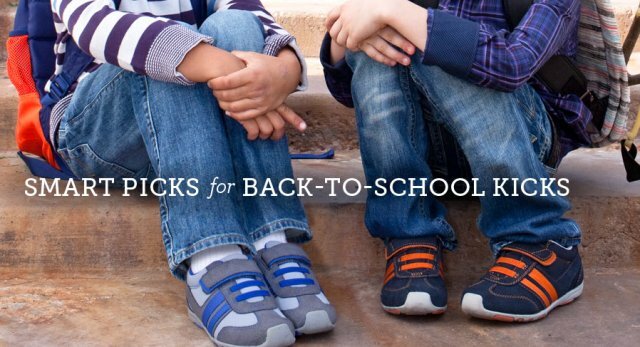 Popular footwear company pediped® launched the new pediped ♥ ‘s Schools, a one-of-a-kind giving campaign where participating schools receive a check for 10% back on their total attributed purchases of pediped® Footwear. Each school can earn up to $10,000 per year. I’m excited to celebrate the start of a new school year with kids everywhere. Schools need our help now more than ever and it’s essential for them to have the things they need. Giving back always has and will continue to be a core value of pediped. School officials, parents and teachers can enroll their school into the program by visiting pediped.com/pedipedschools. Each school receives a unique code that’s used by shoppers at checkout when making a purchase on pediped.com or in any pediped® owned boutique. The pediped® team tracks these purchases so each school can receive 10% back on their total combined purchases. Purchases will be tracked now until May 15, 2014, and schools will receive their checks in June 2014. Any purchases made after May 15 will roll over to the next school year. Schools are also able to track their earnings on pediped.com. “We are receiving heavy support from parents and teachers alike who see the value in creating awareness on the importance of providing schools with adequate resources,” Angela says. Fastest growing children’s footwear brand in the United States. Known for exceptional quality, comfort and distinctive styling, the award-winning pediped company recently opened three boutique retail stores in Las Vegas, Shanghai, China and in Brno, Czech Republic. pediped® footwear is now sold in over 2,500 stores in the United States and 40 countries worldwide. Specializing in healthy foot development, pediped® is dedicated to enriching the lives of children. In addition to pediped® ♥’s Schools, the pediped® Foundation was established to work directly with charities that are devoted to the health, education and basic needs of children around the world. Since its inception, the pediped® Foundation has donated nearly two million dollars in product and monetary support. Another Hilary Abbott Communications client! Children’s Retail Today publishes new posts on Tuesdays, Wednesdays and Thursdays. If you want to get the word out about your innovative, imaginative and inspiring products for children, contact me today! Introducing Brian James – for Mom! Ever wished the makers of popular children’s shoe brand pediped® made footwear for moms? Wishes do come true, because –they are! Introducing Brian James™ New Essential Women’s Footwear Collection from Angela Edgeworth, founder of the award-winning pediped brand. The début collection launches for Spring/Summer 2013. Angela was inspired to develop a women’s line after years of countless requests from moms, celebrities and fans looking for the same quality, comfort and style as their kids’ pediped shoes. The Brian James collection highlights seasonal designs essential to any women’s wardrobe. Angela says, “Brian James reflects a sense of timelessness and relaxed elegance, focusing on luxurious fabrics and a perfect fit.” With soft, flexible soles, all-leather uppers and linings, “this line meets the needs of every trendsetter’s desire for style and every shopper who puts comfort first. Also based in Nevada, the Brian James™ Spring/Summer 2013 collection features four different styles: the Katherine Sandal, Chantal Sandal, Angelle Sandal and Angie Ballet Flat available in EU sizes 36-41 (US 5.5-11). Purchase online at www.brianjamesfootwear.com and in select retail stores. Another Hilary Abbott client! Children’s Retail Today publishes new posts on Tuesdays, Wednesdays and Thursdays. If you want to get the word out about your innovative, imaginative and inspiring products for children, contact me today! pediped® footwear Kicking It Up A Notch! The pediped® Spring/Summer 2012 collection includes more than 75 new styles and color combinations across the Nevada-based footwear company’s three signature lines. The Originals® line of soft-soled infant shoes mimics barefoot walking and features a new sole, created based on customer feedback. The sole features a slip resistant diamond tread and is made of all natural high quality leather, just like before. 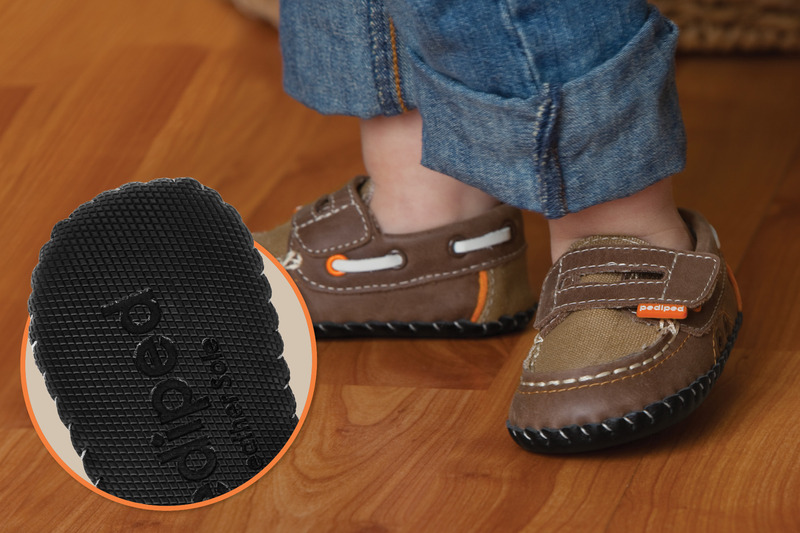 Find out what pediped® parent reviewers had to say about their experience with the improved Originals® sole design by reading real reviews and watching videos here. Grip ‘n’ Go™ footwear is made with all the benefits of Originals®, adding special G2 Technology for active toddlers that are transitioning to walking with a more confident stride. With over 15 new styles, the line features metallic sandals, classic Mary Janes and several new athletic styles. pediped Flex® is the ultimate shoe for confident walkers who have developed a solid, natural stride. The Flex line offers more than 60 styles in jewel tones, metallics and bright colors. The popular Adventure Line of rugged, water-safe, eco-friendly footwear has also expanded with over 15 styles. The Minnie and Amazon for girls both come in pediped’s new summer color pool. Fin, Delmar and Sahara are three new boys’ styles making their début, all with bright pops of color. pediped® footwear is sold in over 3,000 stores in the United States, 40 countries worldwide and online at pediped.com. Children’s Retail Today publishes new posts on Tuesdays, Wednesdays and Thursdays. If you want to get the word out about your innovative, imaginative and inspiring products for children, contact me today! Karen Lu joins pediped™ as a national account executive, working to grow the company’s U.S. business. The Henderson, NV-based footwear company manufactures more than 120 designs for boys and girls with two lines: Originals, soft-soled shoes for newborns to age 2+ and Flex, rubber-soled shoes for children 1-6 years. Angela and Brian Edgeworth launched pediped in 2004 by creating the perfect soft-soled shoe for their first daughter. Now the award winning company is one of the fastest-growing children’s footwear brands in the U.S., sold in over 2500 stores and in 40 countries. Prior to joining pediped, Karen spent nearly 15 years honing her retail and sales skills across several industries, most recently with IBM and NCR. With an MBA from Stanford and a BA from Cornell University, Karen is also bringing book-smart business sense to the children’s wear industry. We wish Karen well on her journey with pediped!